Flying for the 350th time, a Proton rocket launched three new satellites for Russia's space navigation network Monday to ensure the system continues providing coverage of its home territory. 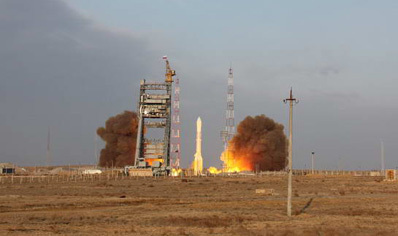 The Glonass spacecraft launched at 1038 GMT (5:38 a.m. EST) from the Baikonur Cosmodrome in central Kazakhstan. The silver and white launcher, propelled by hydrazine fuel, ignited and quickly roared away from the space center on the power of six main engines. The Proton's three core stages placed the Block DM upper stage and three Glonass satellites in a temporary parking orbit less than 10 minutes after liftoff. Two burns of the Block DM upper stage were planned to put the satellites in a circular orbit 12,000 miles high with an inclination of 64.8 degrees. The Glonass payloads were deployed shortly after 1400 GMT (9 a.m. EST). The Russian Space Agency said the upper stage released the satellites into the expected orbit. Monday's launch was the 350th flight of the workhorse Proton rocket. The booster was originally conceived as a vehicle to heave massive nuclear bombs to distant targets, but the Proton's mission was changed to a satellite launcher in the 1960s. Since debuting in 1965, Proton variants have launched military and commercial satellites, interplanetary probes and modules for manned space stations. Each of the 3,000-pound Glonass satellites is designed to last seven years broadcasting navigation signals to Russian military and civilian users. The Glonass system is Russia's counterpart to the U.S. Global Positioning System. Glonass data are used around the world to determine users' coordinates, velocity and precise time. The fleet has been stymied by underfunding and delays throughout its 27-year history, its coverage declining as Russia suffered from economic ruin following the collapse of the Soviet Union. The Russian government has pledged more money for the program in recent years in an attempt to rejuvenate the satellite constellation to provide continuous global coverage. Today's Glonass system includes 19 satellites, but one of those is about to be decommissioned and two more are out of service for maintenance, according to an update posted this week on the Russian Space Agency's Web site. The three satellites launched Monday should ensure the fleet provides blanket coverage of Russian territory, which requires 18 operating spacecraft. Global service requires 24 healthy satellites. Glonass spacecraft are positioned in three planes, each designed with eight satellites to provide worldwide coverage. But only one of the three orbital planes currently contains eight spacecraft, according to the Russian Space Agency. Russia planned to launch six Glonass satellites in two launches this year, but a mission in September was postponed due to technical issues. 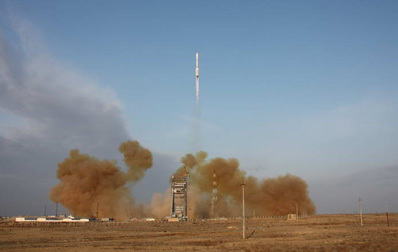 The next Glonass launch is now scheduled for February.